What Kind of Medicine Is Available for Dark Circles Under the Eyes? Under-eye circles are common as you age, since skin elasticity weakens and it loses collagen. However, according to the Mayo Clinic, dark circles under the eyes can occur at any age, in both women and men. When preventive measures fail, there are different over-the-counter products you can utilize to help minimize and prevent the dark circles. There are also surgical options available for persistent eye circles. Dark circles under the eyes occur when you lack sleep. However, persistent dark circles are likely related to aging or even an underlying health condition. The Mayo Clinic reports that causes range from thinning skin, eczema, too much sun exposure, smoking, drinking and irregularities in skin pigmentation. Hay fever is another common cause of dark circles under the eyes. According to Medline Plus, pollen from grasses, trees and weeds can cause this and other allergy symptoms. Under-eye circles related to allergies are also called "shiners." 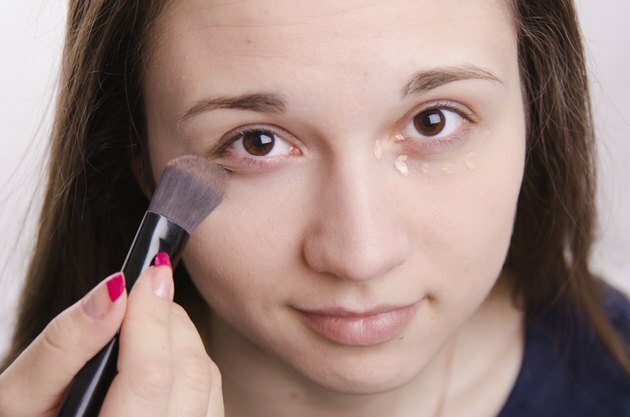 A concealer can cover up occasional dark circles. The Mayo Clinic explains that a peach-colored concealer works best against the bluish color that dark circles have. There are medicated concealers available over-the-counter. However, the Mayo Clinic reports that glycolic acid and salicylic acid are contained in some products, which can worsen dark circles. Other companies sell solutions to help relieve puffiness associated with dark under-eye circles. An example is Mary Kay's Time-Wise Targeted Action Eye Revitalizer. Dark circles that are related to hay fever can be alleviated by taking allergy medications. Dark under-eye circles from allergies are a result of sinus problems. Medline Plus explains that nasal sprays can help relive hay fever symptoms. Also, saline sprays and nasal rinses can help remove pollen trapped in the sinuses. For long-term pollen allergy control, Medline Plus recommends allergy shots. Over time, allergy control can help prevent allergic shiners. According to the Mayo Clinic, a dermatologist can prescribe a soothing cream to help fade under-eye circles. Such products contain vitamin E and vitamin K. You may consider a medical procedure for persistent under-eye circles that fail to disappear with other forms of treatment. Doc Shop explains that available treatments include collagen injections, chemical peels, dermal fillers and laser resurfacing. However, the Mayo Clinic cautions that such procedures are not guaranteed to work. Although dark under-eye circles are often hereditary and occur as you age, there are a few steps you can take to prevent their appearance. Doc Shop recommends that you wear sunscreen and sunglasses whenever you are outside. Do not skip on sleep and ensure that you eat a diet rich in iron. Drink water throughout the day. Excessive amounts of caffeinated drinks can also cause under-eye circles, according to the Mayo Clinic.